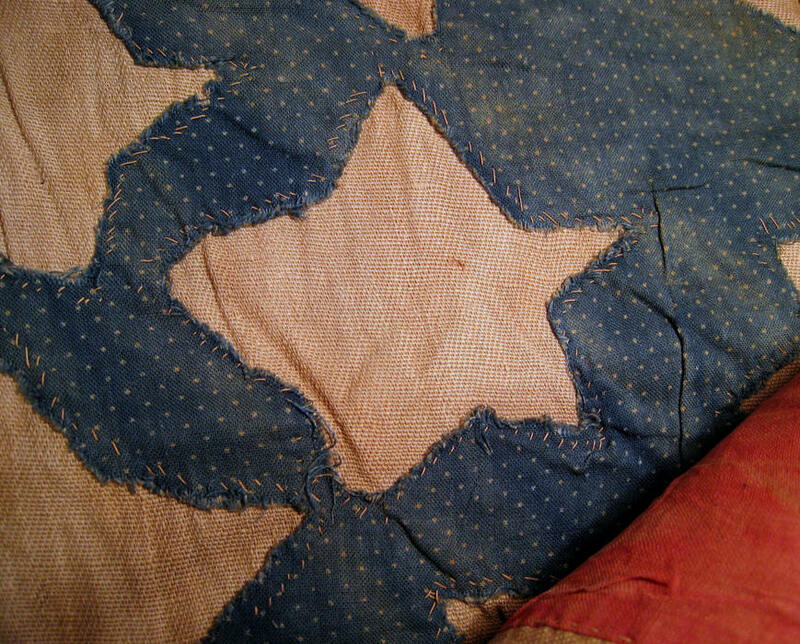 The ways by which stars are added to the canton of a flag are very varied, and the different techniques employed are often good indictors that help to determine a flag's date and usage. Here we explore the various techniques and terminology related to the application of stars to an American flag. Methods for applying stars that I am familiar with are: sewing, painting, printing, clamp-dying, gluing, stamping, embroidering, crocheting, affixing and reverse-appliqué. There may be other methods, and I encourage other collectors to share their experiences with other techniques. The effect of each technique leaves a distinct character on the flags themselves, and is an important aspect in the great variability of American flags. Of the methods for applying stars by sewing them to a flag, the two predominant methods are single-appliqué and double-appliqué. 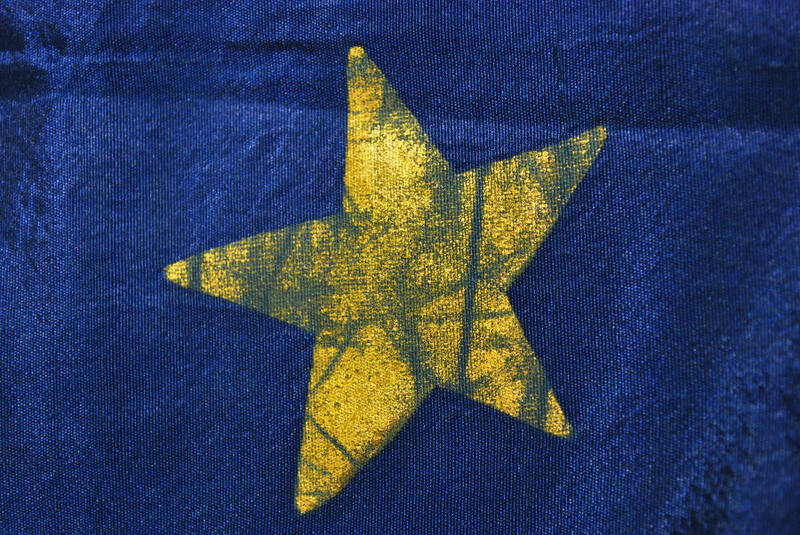 On single-appliqué flags, the maker cuts a hole in the blue canton in the shape of a star and uses a single piece of white fabric to create the star. 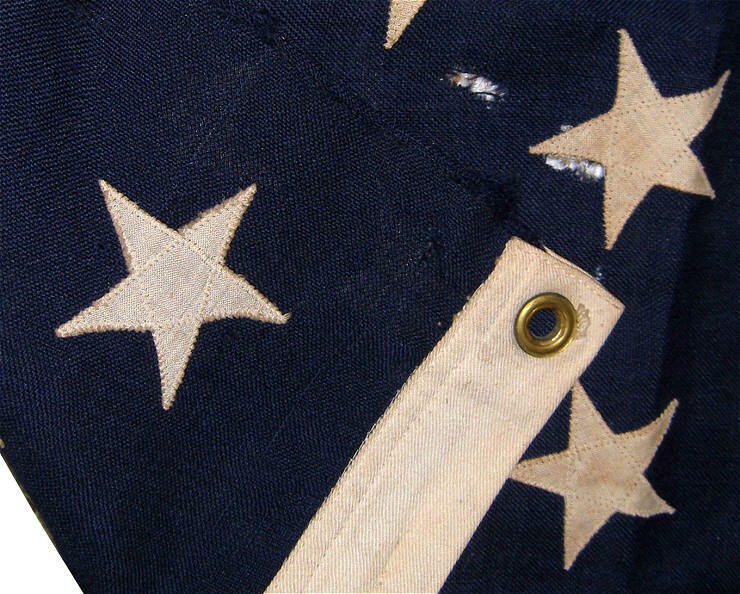 Although the term "single-appliqué" is commonly used to describe this "cut through" approach, it would also accurately describe flags with stars only sewn to one side of the canton. On double-appliqué flags, the maker cuts two white stars and stitches them back-to-back, one on each side of the canton. Technique: Sewn, Single-Appliqué. This photo shows beautiful single-appliqué work on a magnificent 4-5-4 pattern maritime flag made in Boston, circa 1870, by the firm of Leighton and Pollard. The entire flag is hand-sewn. Technique: Sewn, Double-Appliqué. The stars on this late period 13 star ensign are sewn onto both sides of the canton, back to back. 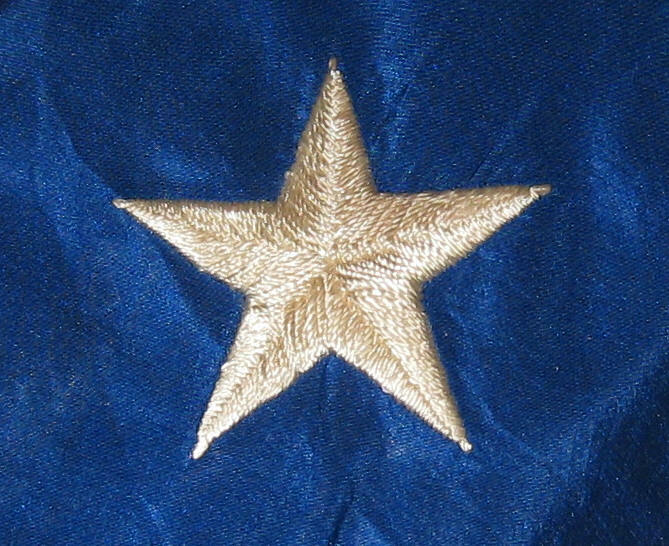 The use of a zig-zag stitch that crosses the center of the star indicates that the flag is most likely not earlier than 1892 when the zig-zag stitch technique for applying stars was patented. Painting is an obvious choice for applying stars to a flag, yet painted flags are somewhat scarce. The reason is most likely because flags, being made from fabric, have always been sewn by seamstresses who most likely find it natural to simply sew fabric stars, rather than switching to another medium. 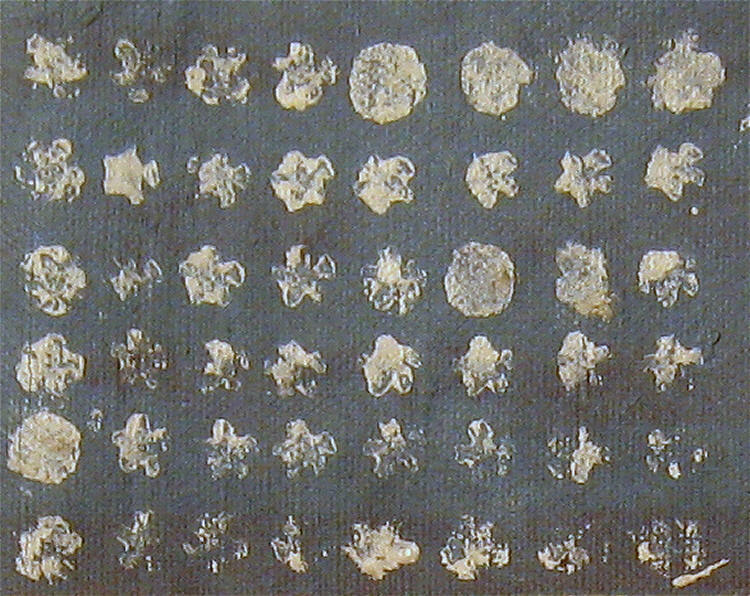 There are some cases, however, where painting stars makes sense, and each case is shown here. One case is where painting allows easier production of complex designs. 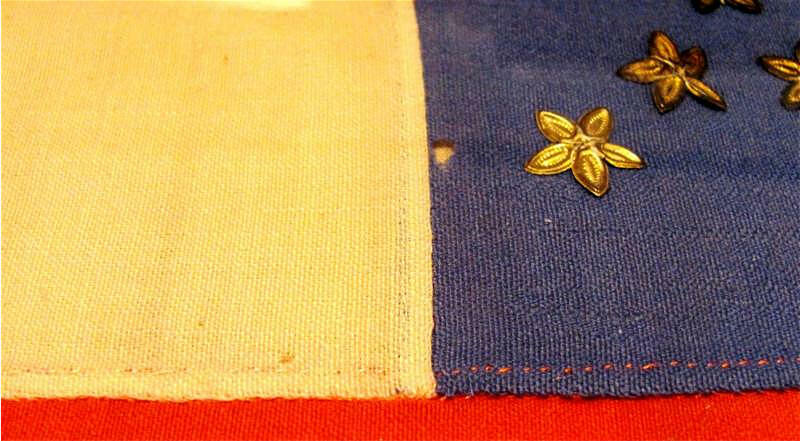 A second case is the use of gilt paint on silk flags, a technique typically reserved for military flags where strong, light, silk is better suited to weathering harsh battlefield conditions than other materials such as cotton, where the flags are lighter than wool flags when carried on horseback, and where the integrity of the silk, un-punctured by sewn stars, most likely resulted in less tearing and breakdown. A third case is where materials are scarce or the flag is made hastily from readily available materials, one of which is paint. A fourth case is where specialized paints increase the lifespan of the flag and afford it certain properties, such as a higher degree of reflectivity and a protection against discoloration with age. Technique: Painted. 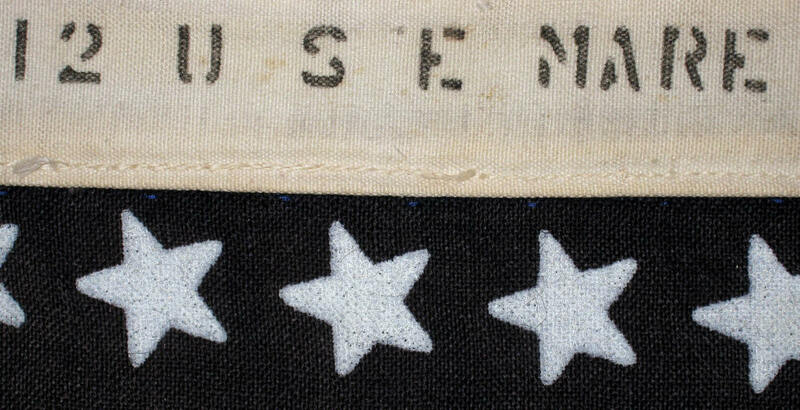 This is a close up view of the painted stars on an official U.S. Navy Ensign, Size No.12, produced at Mare Island in 1944. 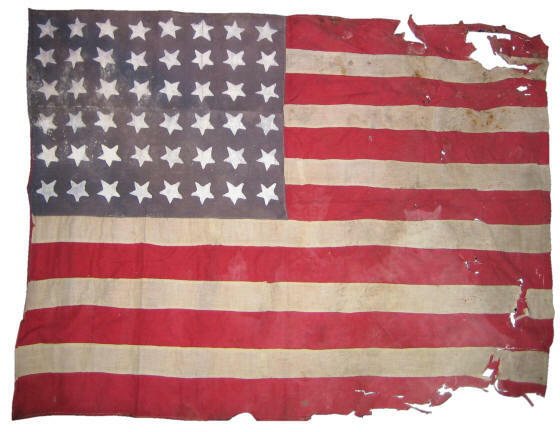 Wear on the flag indicates that it was used at sea and is most likely a World War II Battle Flag, though the specific ship attributed to this flag is unknown. The rubberized paint used for the stars appears bright and almost reflective. Technique: Painted. 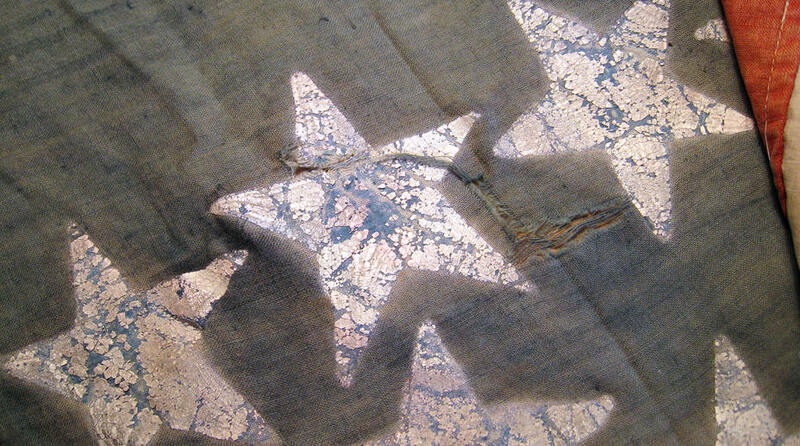 This gilt painted star is on the 34 star battle flag of L Company, 102d Pennsylvania Volunteer Infantry. 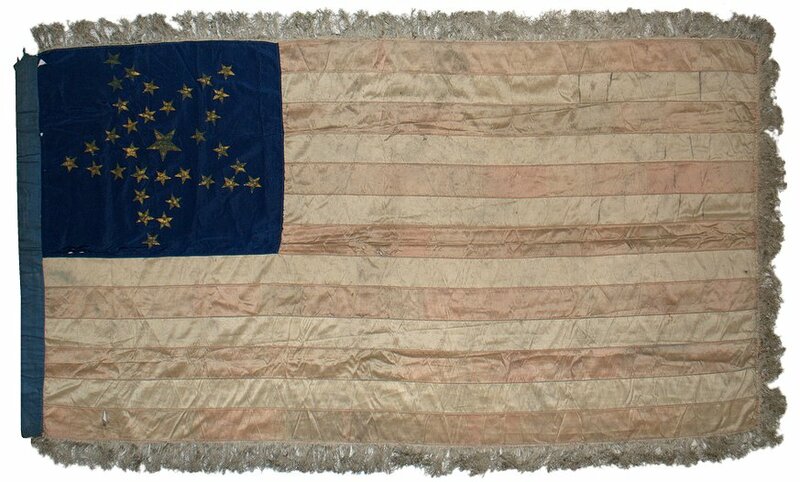 A true documented Civil War flag carried in the field, the flag was produced at the absolute height of silk and gilt battle flag making. 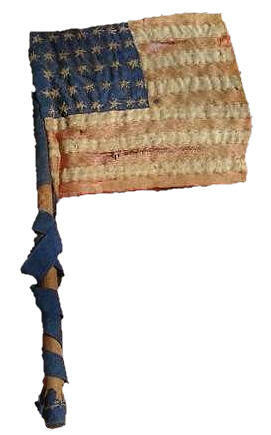 The silk of the flag, despite weathering, remains in an extraordinary state of preservation. The stars show wear, further evidence of its use. Technique: Painting. 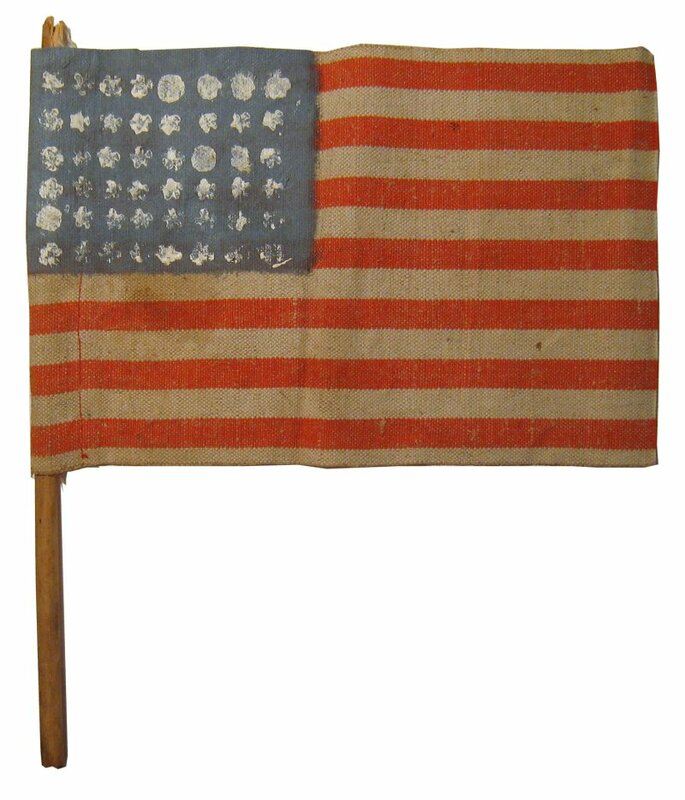 The painted stars on this flag were hastily done in an environment where materials were most likely scarce. The flag is a homemade Liberation Flag made in Saone, France in 1944. Technique: Painting. 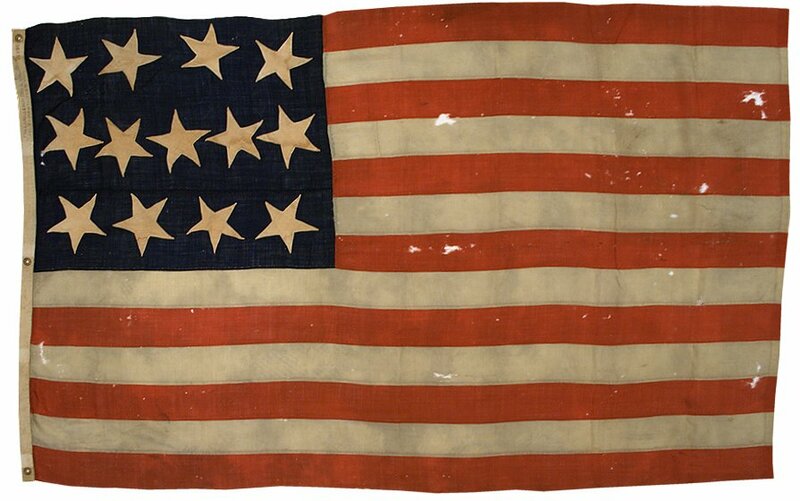 The old paint surface of the stars on this exceptional 43 star flag show evidence of their age. The creator used painted stars to create one of the most visually exciting cantons one can find on an antique American flag from any era. Click here to read more about this flag. Printing stars is actually a misnomer. In fact, in most cases, the stars are not printed, but rather the blue canton around the stars, and the stars themselves remain the color of the base fabric of the flag. Printed parade flags most commonly fall into this category. Technique: Printed. This is a close up view of the canton of the Andersonville Prison flag. 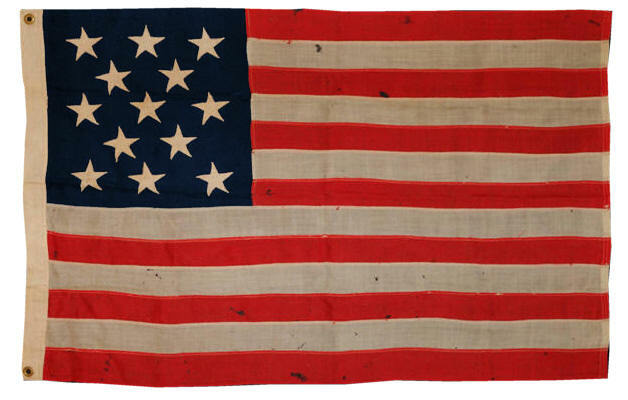 This is a good view of a printed parade flag that is solidly attributed to the the period of the Civil War. The process for clamp dyeing involves clamping the fabric of the flag such that the shape of the stars is clamped and does not take on dye. The process dates to the mid-19th century. Once the section of the flag which is clamped is dyed and dries, the clamps are removed and the stars remain the color of the base fabric. In theory this could be a process that could scale to mass production and produce large flags without the need for sewing stars (unlike the process of printing, which becomes cumbersome the larger the flag). In practice, bleeding of the dye into the star region resulted in a perception of manufacturing defects, therefore making the process less commercially successful than hoped. Technique: Clamp Dyeing. Close examination of this star shows some of the irregularities introduced by clamp dying, such as the stubby tip of one of the star points and some minor bleeding of the blue into the white area of the star. 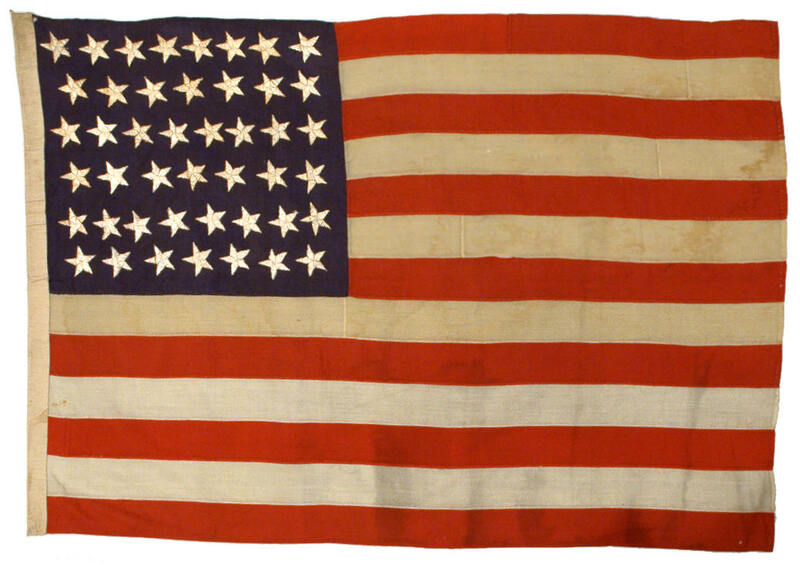 This unusual flag features 54 stars and dates to the early 20th century. Although it's debatable whether stamping is simply another method of applying painted stars, I include it as a separate category simply because it is a variation of a technique to apply the stars. A stamp in the shape of a star might be fashioned from wood, metal, rubber, or another material, and then dipped into paint and pressed onto the flag. This differs from actual painting where a brush is used to apply the paint, and close inspection of some painted flags shows evidence of stamping as the technique for applying the paint. Technique: Stamping. 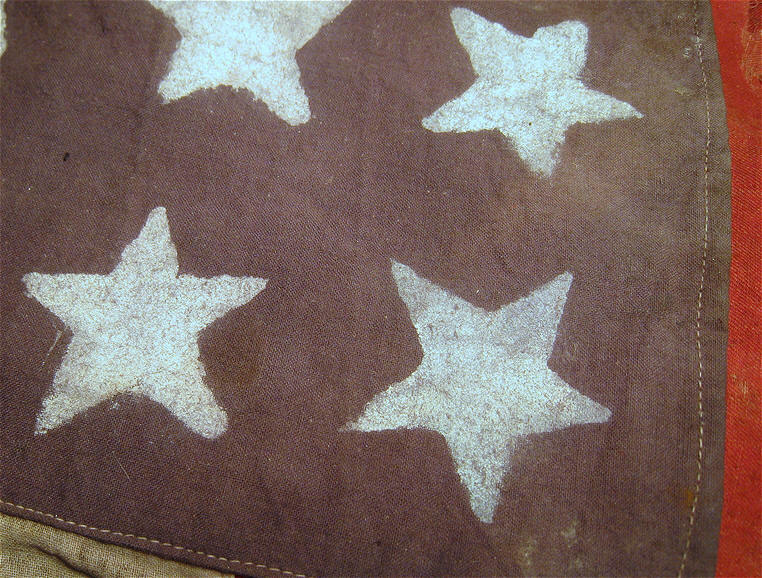 This close up view of a Liberation Flag made in Calais, France in 1944 to welcome American soldiers shows evidence of stamped stars. The stars are very small, but are of uniform size. 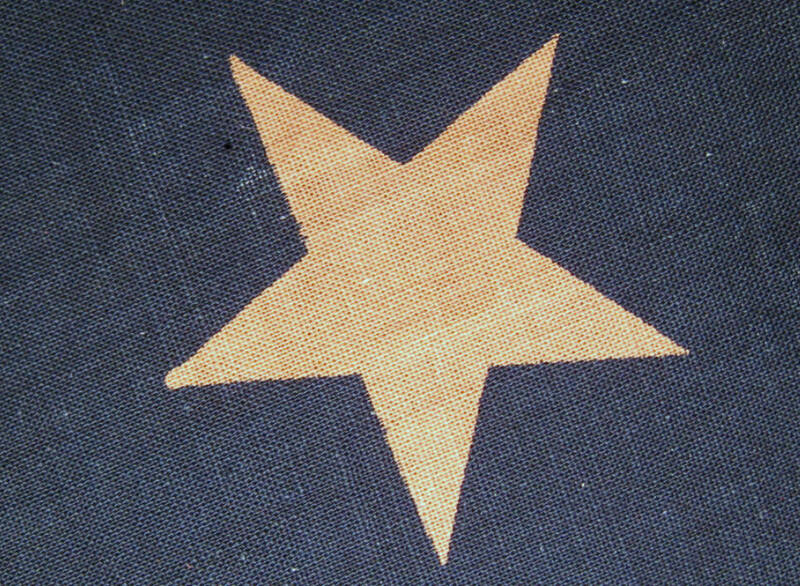 The paint's application is uneven and areas of thick paint on the edges of some stars, as well as the circular imprint of other stars, leads me to believe that the person making the flag probably carved the shape of a star onto the tip of a wooden dowel, and used the dowel to dip into paint and stamp the stars onto the painted canton. 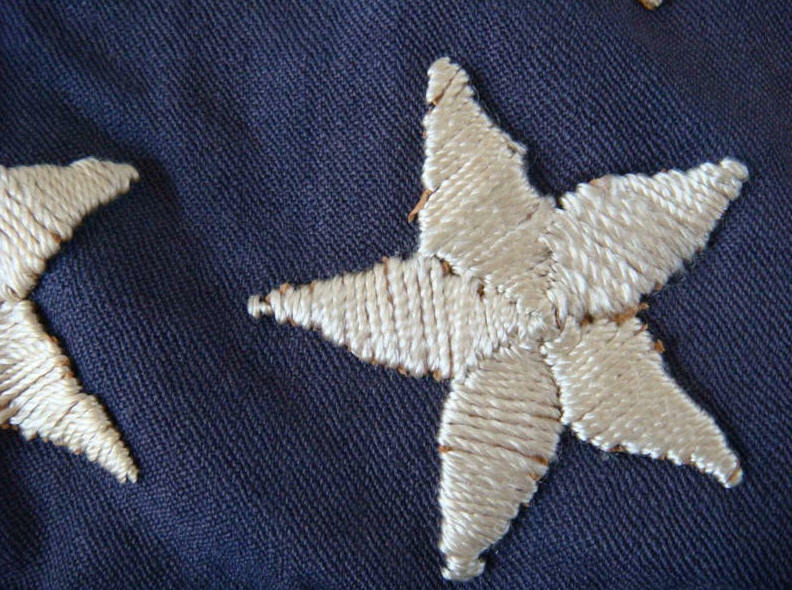 Embroidered stars are made by building up individual stitches of thread to form the star. Embroidery is often done by hand, but by the late 19th century and through the modern day, machine embroidery is used to apply stars that are very regular in size and shape. 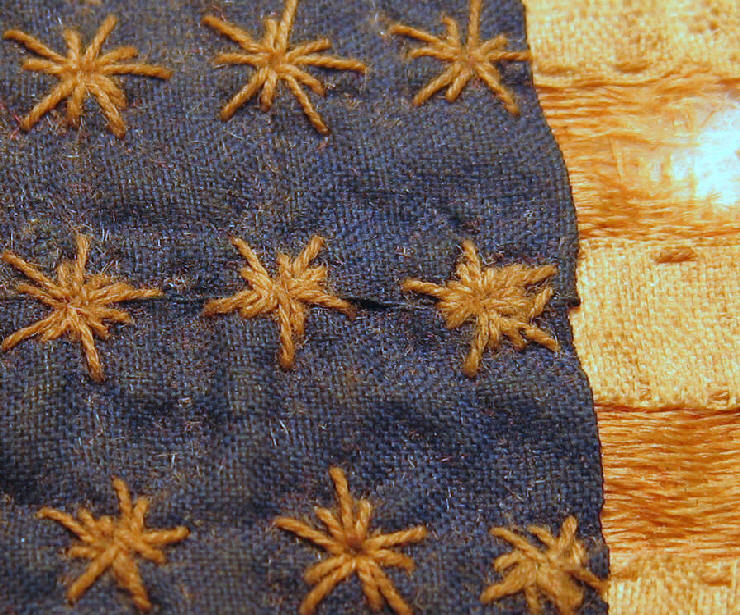 Hand embroidered stars on flags that date to the early 19th century are known to exist. Technique: Embroidered. 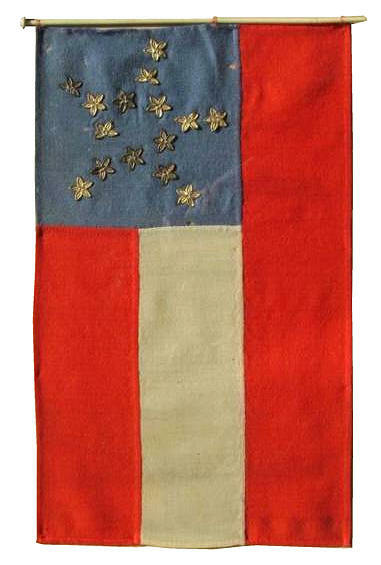 These crude embroidered stars on this Civil War era homemade parade flag are intricate, yet minute. The entire flag is just 2.5 inches square, and the canton just 1.5 inches square. Yet the flag features the entire complement of 34 stars. The stripes of the flag are also embroidered. Technique: Embroidered. Here the entire body of the star is embroidered. 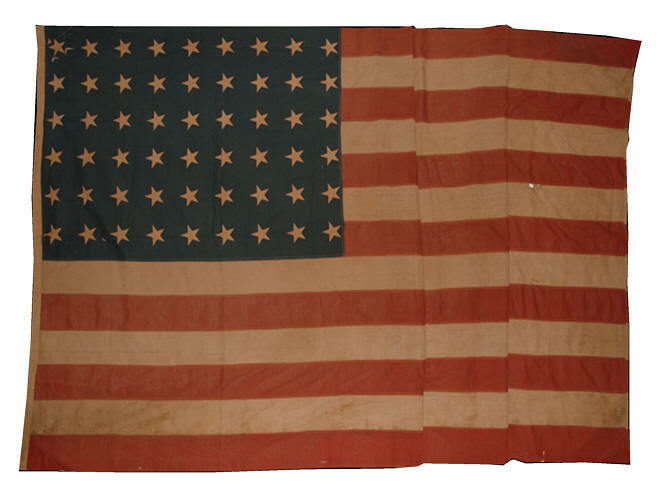 This flag of 46 stars, circa 1910, is made of silk and was produced as a military stand of colors. Technique: Embroidered. 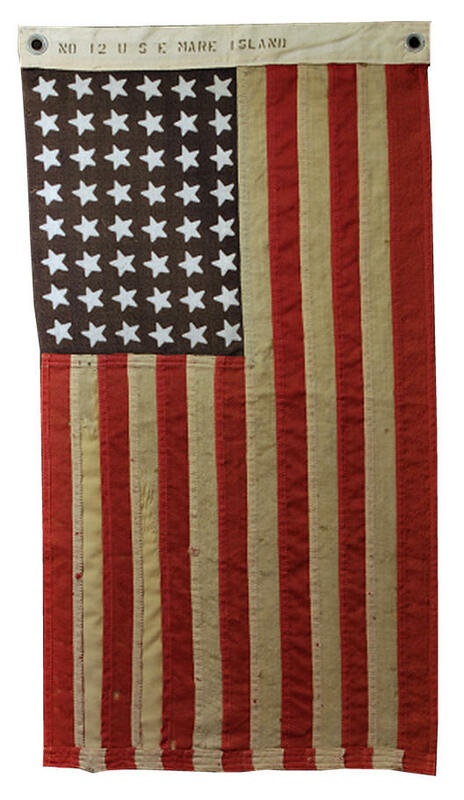 The stars of this hand sewn homemade 45 star flag, circa 1900, are hand embroidered, with the embroidery covering a base in order to build up and define the shape of the star. Technique: Embroidered stitching. 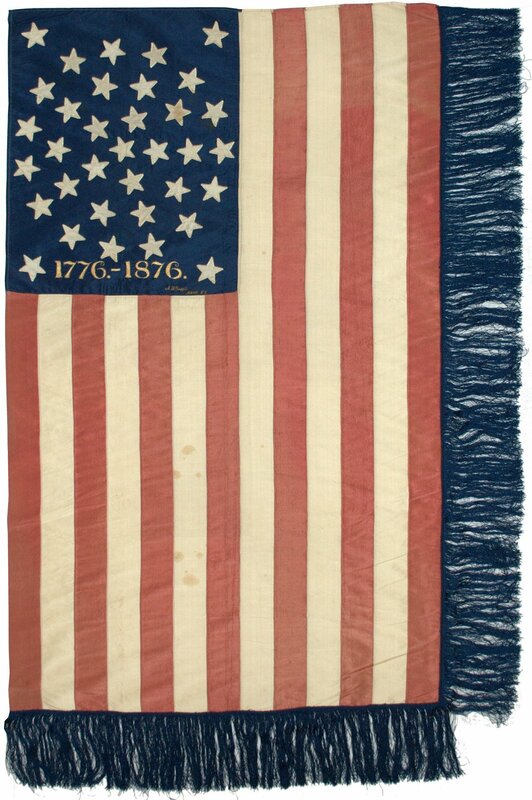 The stars of this superb homemade flag from the American Centennial are made of cut silk, but rather than being sewn to the canton with a simple stitch, the seamstress, Ms. A. Whipple of Albany, New York, embroidered the borders of the stars to affix them to the canton. 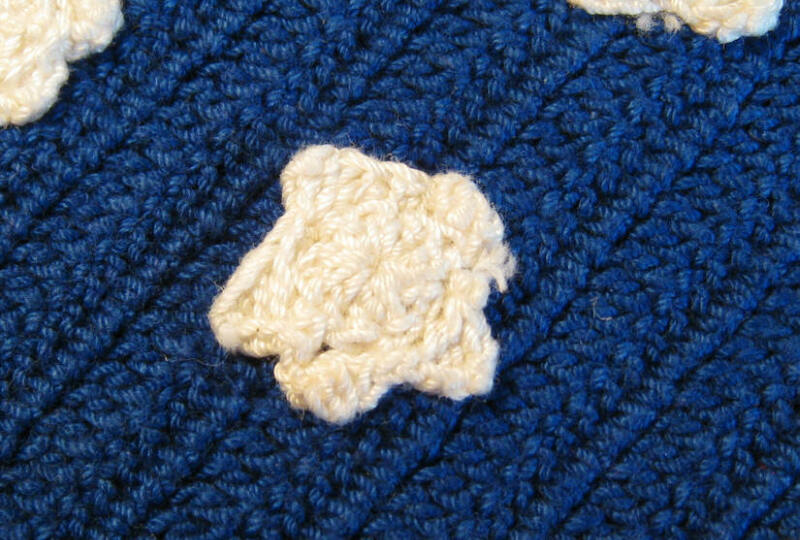 Crocheting or knitting is yet another way to form stars, usually employed on homemade flags that date from the early 20th century to the modern day. Crochet stars are often folky and very intricate, especially when made for the cantons of smaller flags. Technique: Crocheting. 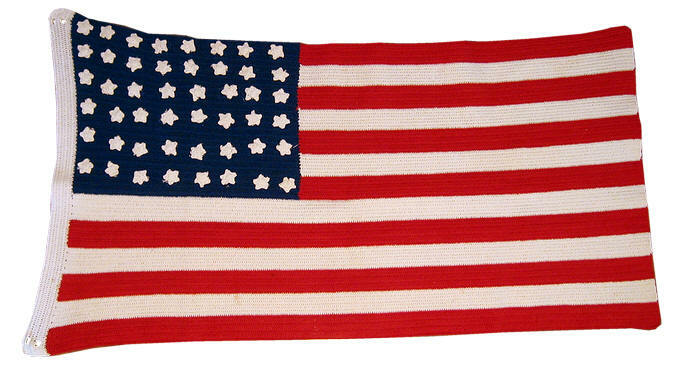 The fine small crochet stars on this early 20th century 48 star American flag are evidence of a very skilled hand. The flag features 48 double-appliquéd stars of this type, therefore the maker had to create 96 of these tiny stars to produce the flag. The crocheting of the canton seen here is further evidence of a very talented hand. Technique: Crocheting. 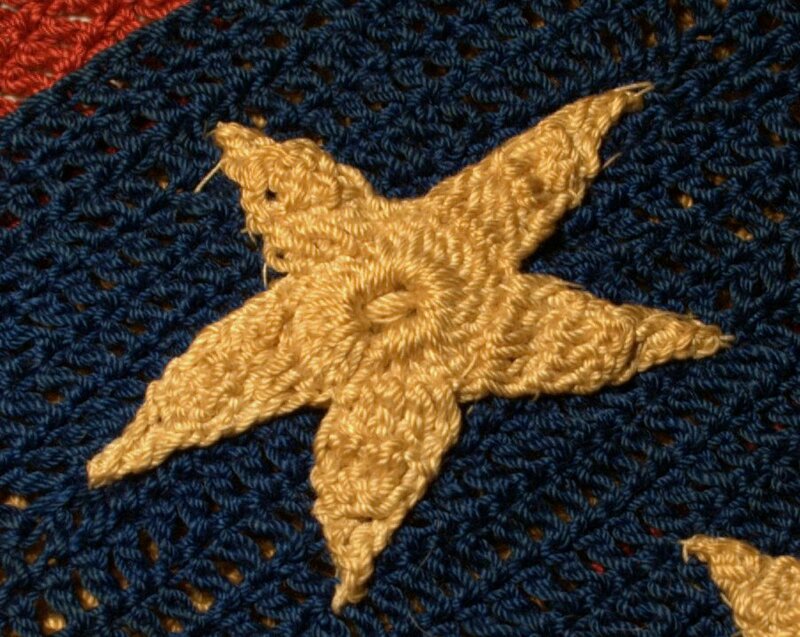 This crochet star is on one of the most elaborate and beautiful crochet American flags of the 20th century. 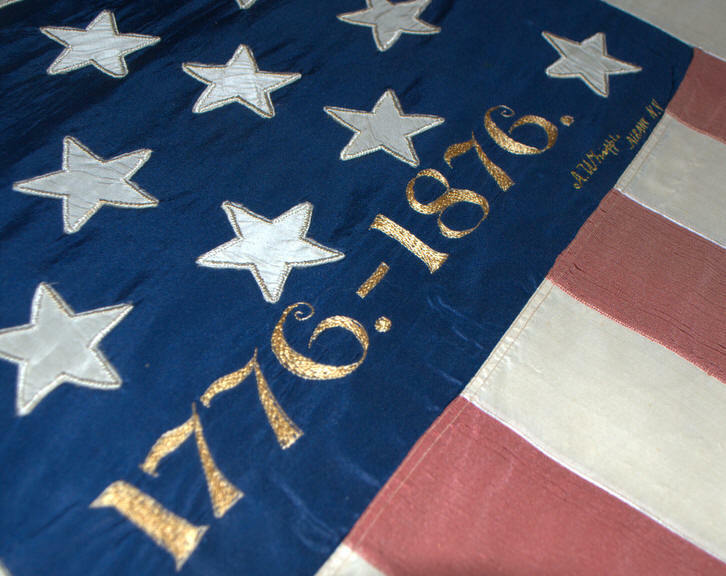 At over six feet in length, the workmanship was a monumental effort for the flag maker. 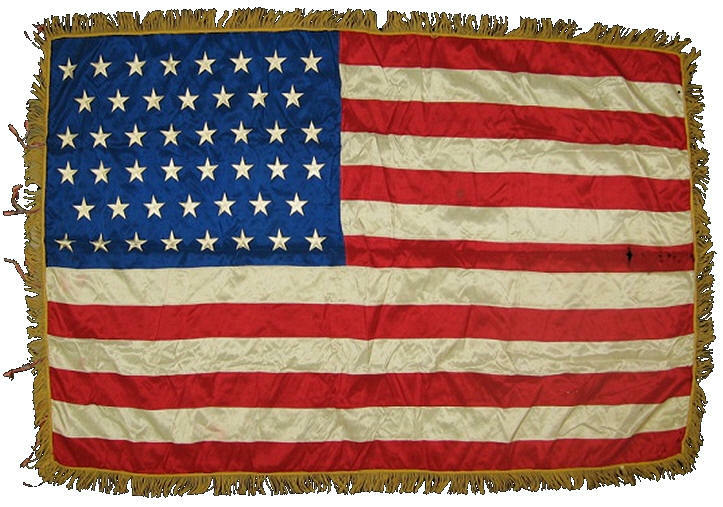 All aspects of the flag, including the hoist and whip stitched grommets, are crochet. Stars that are affixed to a flag are usually made of a material that is difficult or impossible to stitch into without causing damage or undesired effects. The stars might be made of metallic foil, plastic or other materials. Technique: Affixing. On this Confederate Bible Flag, fifteen gilt foil stars are affixed using a star-shaped cross stitch across their centers. The gilt foil is similar to the material found inside the cases of Civil War era photographs. 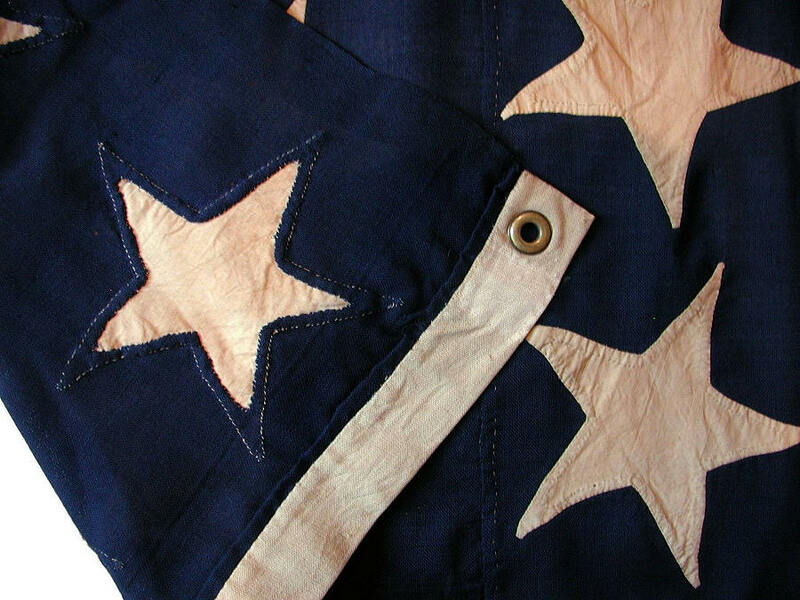 Reverse-appliquéd construction involves cutting through the shape of stars on the canton and sewing the canton to a single piece of white fabric, which serves as the flag. On some reverse-appliqued flags, the canton is cut and sewn to both sides of the flag, allowing the white fabric to show through, forming stars on both sides. This technique is very rare and usually leads to flags with a very folky appearance. Technique: Reverse-Appliqué. 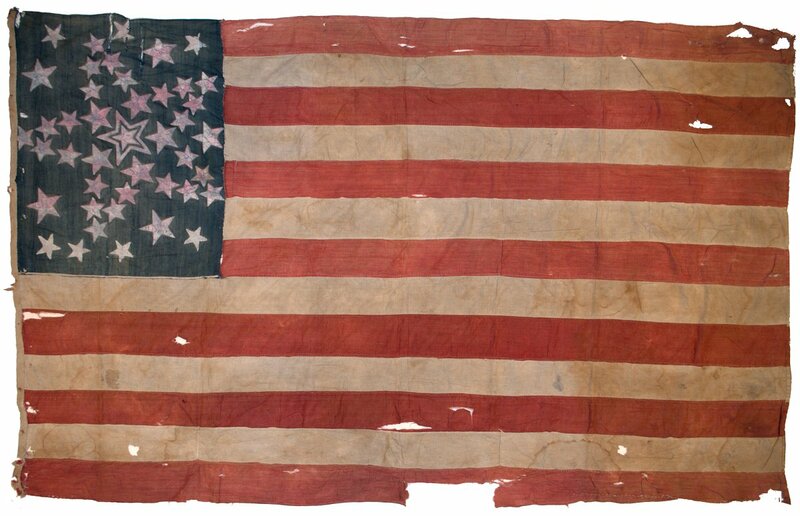 This fantastic flag of the Civil War period features 35 reverse-appliqué stars on both sides of the canton, made by cutting through pieces of calico dress fabric. The red stripes are also appliquéd to the flag on both sides. The flag was hung from the Olive Green General Store in Olive Green, Ohio on the border of Ohio and West Virginia. The three holes across the flag are bullet holes shot through by Southern sympathizers who fired on the flag as it hung over the general store, enduring evidence of tensions within the region over West Virginia's secession from Confederate Virginia. 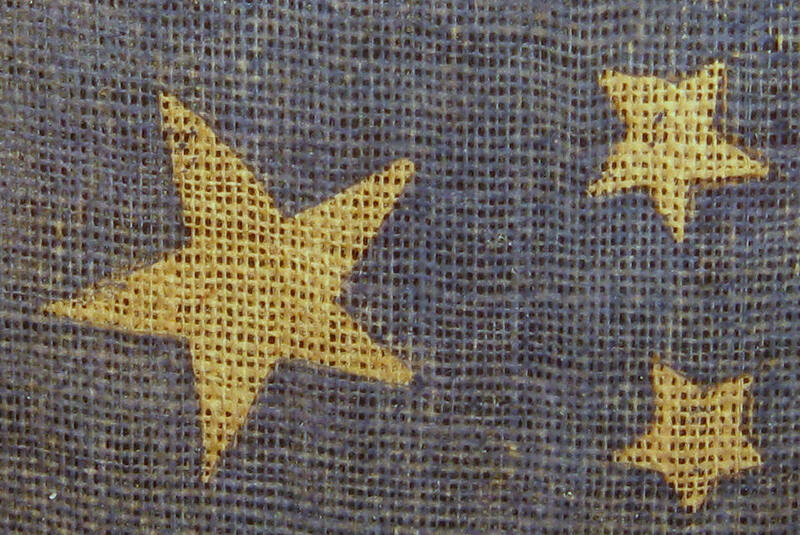 Cut stars glued to the canton are a common way of affixing stars onto flags made at home or by school children.